First off, this whole business of calling top round "London Broil" really irks me. 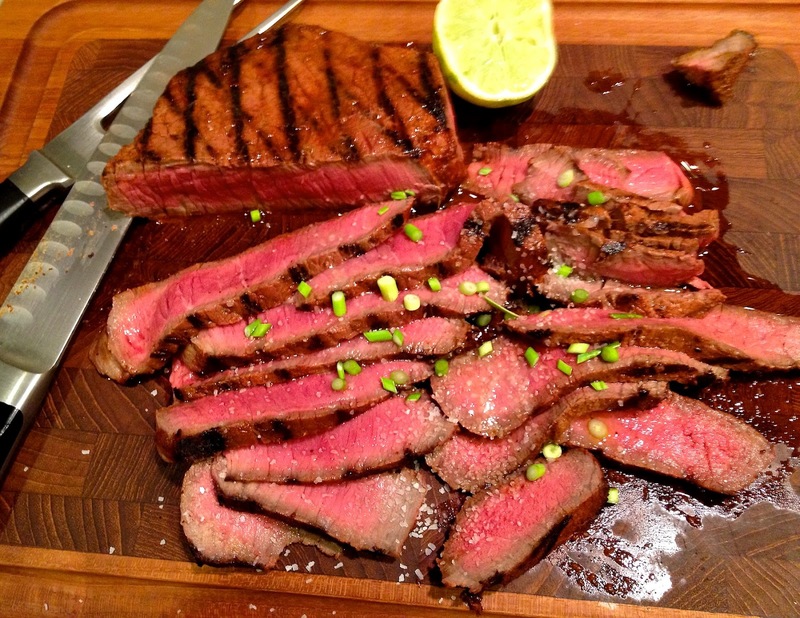 Somewhat of a traditionalist at heart, real London Broil, in my heart-of-hearts will always be flank steak. This new nomenclature, calling top round steak London Broil was foisted off on us supposedly by supermarket meat departments (according to my butcher) because there are only a couple of flank steaks on a steer, but a whole lotta top round. Yes, I know it's leaner, and cheaper, but it's not as tender or tasty. So if you have one of these, as I did lurking in the freezer, you need to boost the flavor, hugely. Whew, now that I got that off my chest, I have to say that top round can be fabulous. I picked this one up back in May, a nice grass-fed piece of beef top round while it was on sale at my local Whole Foods. Since we just returned from a vacation at the beach, and I haven't had a chance to do any marketing, it just leaped out of the freezer into my hands. Yes, it did. So I did what any smart girl would do: I thawed it out, and dolled it up. This wet rub has big flavor, and it's all likely to be things that live in your fridge and pantry all the time. Plain chili powder, cinnamon, black pepper, smoked paprika, jarred garlic, salt and a lime. The cinnamon makes it taste sweet without adding any sugar, and the smoked paprika adds a smoky zing. Like I said, I didn't have time to shop and we still want a good meal. Good for low carbers and paleo eaters as well as everyone else who likes good meat. Because this meat is so lean, after grilling, a finishing drizzle of really good extra virgin olive oil, flavored olive oil or a pat of butter (flavored or not) would be nice. If you are eating Paleo, or just lazy like me, go for the olive oil. But if you have some minced green garlic scapes in your freezer, or can mince some garden garlic chives, toss them on the meat, drizzle on the oil, add a squeeze of fresh lime and dig in. This rub works really well on flank and skirt steak, too, so keep it up your sleeve. 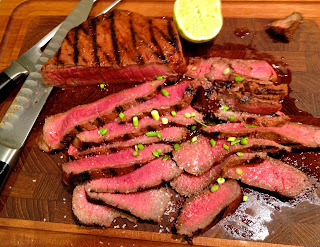 Note: Top round isn't as tender as flank for London broil, so be sure to slice it thinly, 1/4" or thinner, with a sharp knife against the grain. In a small bowl, mix everything through the olive oil, and then rub evenly over both sides of the London broil. Place the meat in a zip bag and chill for at least 2 hours and up to 10 hours. Remove from the fridge 30 minutes before cooking. Pretty much all from the pantry and fridge. When you are ready to cook, preheat your grill to 550ºF. Oil the grill, and then place the meat on the grill and close the top. Cook for 3 minutes, then turn and cook for 4 minutes on the other side for medium rare. Let the meat stand for 5 minutes before slicing thinly across the grain. To serve, sprinkle over the garlic scapes or garlic chives, drizzle with the olive oil and squeeze over the lime. Yes, You Can Roast Frozen Vegetables. Yes, They're Delish. 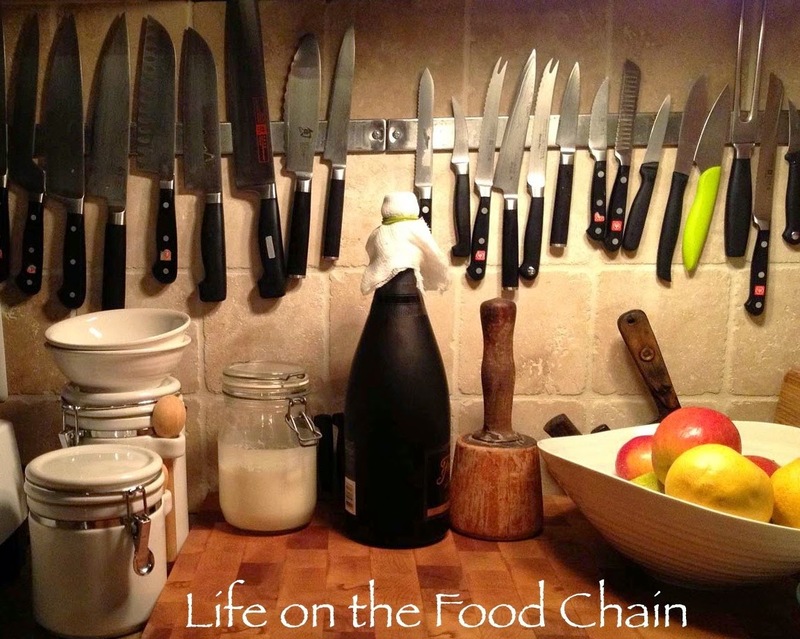 © Copyright 2018, Life on the Food Chain • Judith Roud Lubking. All Rights Reserved. Travel theme. Theme images by billnoll. Powered by Blogger.